Machella spent many years of her life in and out of the foster care system. When plans to return home to live with her father did not materialize due to his own issues, she found herself homeless and began living with friends from her church. When those friends could no longer support having her live with them, she applied and was accepted to our Teen Transitional Living Program (TTLP). Once admitted to TTLP, Machella worked hard at school to maintain herself as an honor roll student and worked part-time at McDonalds. Working and saving her money was very important to her as she felt this to be necessary for her to be able to attend college after she graduated from High School. Machella was a member of the school chorus and participated in the spring concert. In addition, she overcame her fear of singing solo in public by trying out for the Cabaret at Binghamton High school. She successfully auditioned, was chosen to participate and sang a song from Cinderella. Machella graduated from High School this past June and received over $2000 in scholarships for college. Machella attained her dream when she applied and was accepted to Potsdam University where she will be attending this fall. 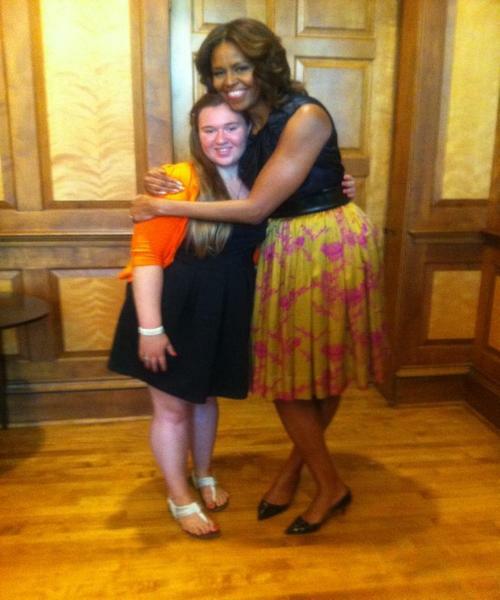 After applying for the NAEHCY LeTendre Scholarship, Machella was invited by the U.S. Department of Education to participate in a “Beating the Odds” conversation with the First Lady of the United States, Michelle Obama, on Tuesday, July 8th. Ten graduating high school seniors from around the country were invited to meet with officials at the U.S. Department of Education, and to the White House, to share what it took for them to overcome the obstacles and challenges they faced in their pursuit of higher education, and challenges they may yet encounter. The discussion was part of the First Lady’s “Reach Higher” initiative to encourage young people to pursue their dreams through college. The National Association for the Education of Homeless Children and Youth and Advocates for Children in New York sponsored her participation by covering her expenses. We congratulate Machella on her success, and wish her the very best in her pursuit of her goals and dreams.